Lately, I have created an image of an (installed, not installable) esxi hypervisor. This way I can at will write it to any media (usb key, harddrive ...) and directly boot to an already installed esxi hypervisor without the hassle of installing it each time. But when I burn this image under windows (using clonedisk), i could no longer boot it ("no hypervisor found" error) whereas burning under linux (with dd) was OK. I first thought clonedisk was the issue except that simply inserting a working usb key under windows has the same effect : my usb key would no longer work afterwards. So it appears windows does change the GPT partition entry behind the scene. Not only does it change some boot flags but it also reshuffles the whole partition table!. 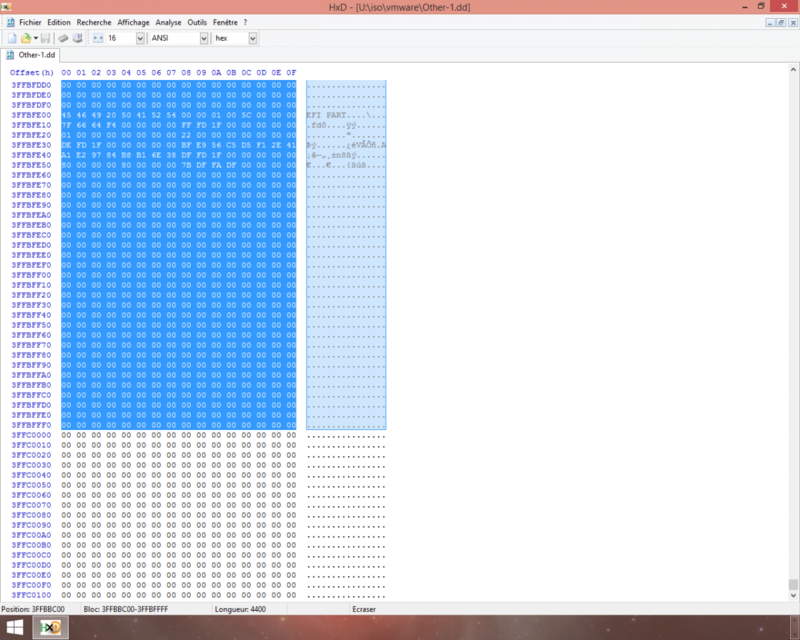 I have attached the before/after 1512 first bytes where the changes occur (change the extension bad to dd or raw). What would be the recommandation to work around this nasty windows behavior? -prevent windows from mounting drives? i can consider it under a winpe environement but then will I be able to write to the media? -add an option in clonedisk to leave the media offline when done writing? -add a flag to the gpt partition table to tell windows to ignore it (does such thing exist)? Note that my scenario involves vmware esxi but this is probably irrelevant the overall question : how can I ensure (in general) that windows will not modify my GPT partition table after I am done writing an image or when I insert such a media? I am not sure to understand. At first sight the "good" file is not " pure GPT", is a "hybrid" MBR/GPT. WHEN does "Windows" (which version) alters its contents? The "good" has seemingly only one partition, whilst the "bad" has seemingly 4 of them. BOTH the "good" AND the "bad" have also NO disk signature (which more or less should mean that it has been "generated" by *something* but never mounted. Most of the differences (once set aside the different number of partitions) are due to checksums, and this is more or less "normal". How exactly the "good" one was created, which partitions it should contain, etc. I installed esxi in a vmware machine (1gb disk) using ESXI Installable ISO. Once installed and tested it was working fine (i.e I rebooted the vmware guest without the ISO), I converted the VMDK to a RAW disk. And then finally wrote this RAW disk to a USB key. If I insert this USB key under windows (or mount the image under windows), the GPT partition table gets modified. I can also add that if I boot a winpe in my vmware guest (where the working 1gb disk sits), at next reboot, i can no longer boot on the disk and will again get "hypervisor not found". So whether I mount the image under my full windows or boot my vm with a winpe, the GPT partition gets messed up. bad.dd comes from the same raw disk after it has been "touched" by windows (which no longer boots). attaching a view from DMDE from the good image. and a view from DMDE from the bad image (i.e after it has been "touched" / seen by windows). Well, what you posted as "good" has a single partition, even if seen in a plain hex editor, maybe you posted the "wrong" file. this 512 sectors difference is "queer". As well it is "queer" (though it may be due to the small size of the image) that the first partition starts at LBA 64 (as it normally would stat at 2048). Additionally, both have "unbalanced CHS/LBA values, and you will have to explain how/why it is a "Hybrid MBR" (i.e. 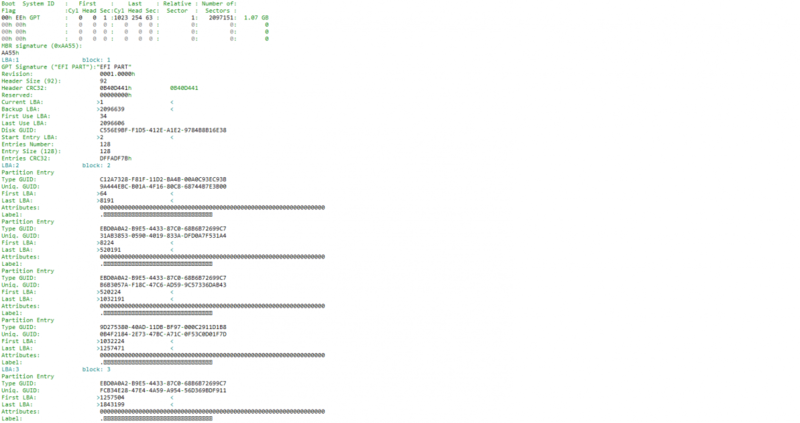 containing boot code). 3 first and 3 last sectors for the good image (booting fine) and the bad image ("hypervisor not found"). 3 sectors = 0x600 / 1536 bytes. Unique and only difference between the 2 images : windows has seen / touched the second one making it a bad image. To resolve this issue, use a Live Linux CD of your choice. Relabel the local datastore and create a partition table with one partition. Then re-install ESXi. Well, the "good" still has a single partition whilst the "bad" still has 4 of them. The DMDE screenshot on your post #4 cannot reasonably be coming from this same "good" image, there is simply NO info on first sector of the GPT partition table. Try again, this time taking 34 sectors from the beginning and 34 sectors from the end of each image. I am starting to suspect that (for *whatever* reasons) the "good" image has the other three partitions on "slots" - say - #35, #42 and #110 and again (for *whatever* reasons) *something* re-orders them (possibly creating some other issue while doing that). Look at these 2 screenshots coming from the good and bad images. The same images i used to extra the 3 first/last sectors. The good image has 5 entries (other 3 blocks) but with 3 empty/dummy ones stuff in the middle : #1, #5, #6, #7, #8. 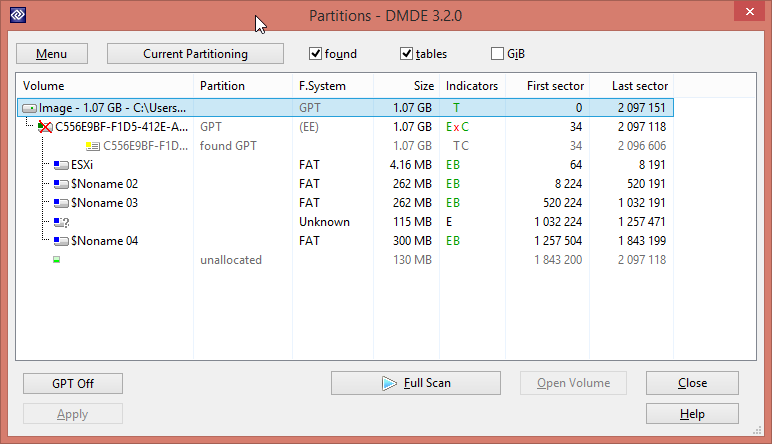 Number of partitions and GUID are the same but not the partition ID's / setup differ. What tool are you using to parse the GPT partition table? Looks like your tool is not parsing correctly the GPT partition in the "good" image? I will shortly attached the 34 first/last sectors of each image. Question remains : why the hell is windows bothering to alter/mess up my partition table?! and how to prevent that (i dont need to fix it as I can easily rewrite my raw image to my media). Probably it believes this setup is wrong but at least it should ask me if I want to fix it or not. Edit : I believe your tool gets "fooled" by the "good" GPT setup and only read one entry because of the 3 empty/dummy entries right after entry #1. Which may indicate that vmware setup breaks the GPT standards : entries should be consecutive? bad_last34.txt 17KB 133 downloadsAs requested, 34 sectors first/last on both images. From thread here, i believe the issue lays there : "Second, I see that ESXi 5.0 leaves an empty partition entry slot(for untold reason) , and Windows shifts the entries behind to fill the gap after GPT modification. So ESXi's boot bank BANK6 gets screwed. I think a VMware so-called BANK is a synonym for a partition entry." Rest assured my tool parses allright what is there, (but it cannot invent what it isn't there). If slots #2, #3 and #4 are empty, and I have not the sector containing slot #5 onwards, the only partition I can see is the one in slot #1. I'll check the 34 sectors files. 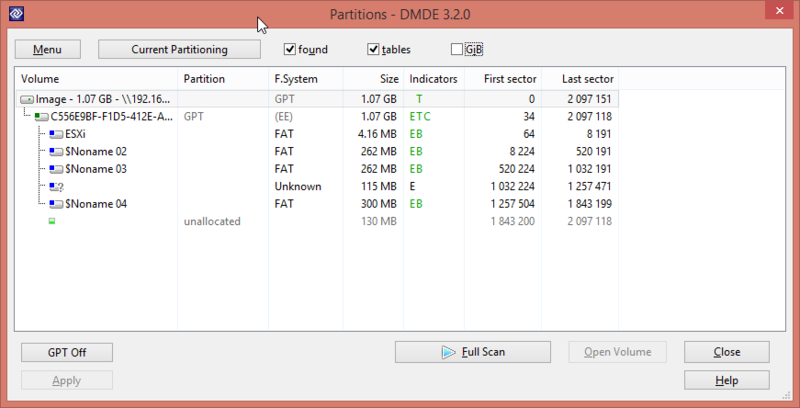 As a first guess, probably we can fill the empty slots with "fake" partitions so that everything is "kosher". P.S. : The good_first34.txt file is only partial, please try again. now attached the right file to the previous post. Make a copy of the "good" image. 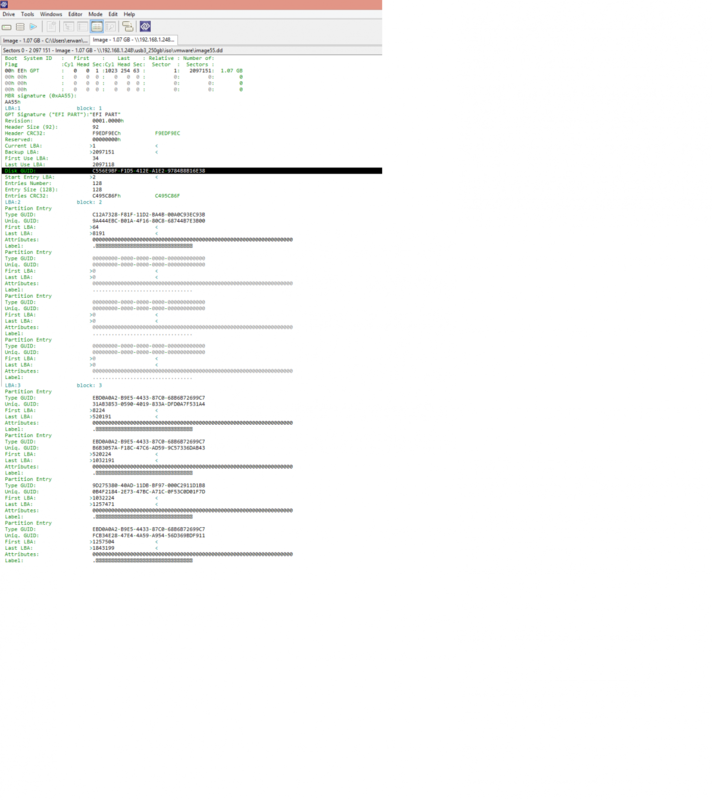 Overwrite first and last 34 sectors with the files attached. Attempt repeating the *whatever* sequence that corrupted the "original" good image. I inserted three (slots #2, #3 and #4) 4 kb partitions (very, very small ) of the Haiku BFS type (which hopefully Windows and *anything else* but Haiku should "leave alone"). The "issue" may be that partition order is still not entirely "kosher" as the order in slots is not the same as on disk. If the image still becomes corrupted it will be needed to slightly shrink (or move the beginning of the EF00 one to sector 34). First part of the test : i replaced the sectors in the "bad" image and it now boots OK.
Second part of the test : i booted winpe with my "known to be working disk", could see my disk, browse partitions, etc. Rebooted directly on that disk, and it is still booted fine whereas I know from previous experience that this would mess up my GPT disk. So what does it tell us? -Windows will rewrite the GPT partition table if it is not up to his taste? i.e empty entries will be removed? -Workaround this behavior consists in rewriting the partition table (main and backup) with dummy entries with type = "Haiku BFS" ? That windows behavior is really nasty IMHO. Is that a bug from Windows, i.e not accepting a GPT "feature" (empty entries) or is that a bug from vmware i.e creating a non standard GPT partition table? Cannot say which is the culprit, most probably it is a 50/50 situation. most probably *any*, including the MS ones such as 0700 would do. But besides the "shift" or "compacting" of the slots, the "bad" GPT is actually "bad", meaning that some fields in the GPT structures are not correctly written (the backup EFI PART is different from "main", specifically it seems like the "bad" GPT backup has been NOT modified to reflect the changes in the main one, as a matter of fact the bad_last34.txt remains the same as the good_last34.txt) which is IMHO a rather "major" issue. table when you save your partitions. Again, last usable sector is (should be) total size - 34, while the "bad" GPT adds a 512 sectors "no man's land". It could be a bug in Windows due to the (too small) size of the image, I wouldn't be surprised if with larger images it would work fine. Well, thanks a lot for your time and expertise (again). I now have a pretty good understanding of the situation and learned a few things around GPT. Vmware coming up with an exotic GPT setup and Microsoft arbitrarily attempting to fix this setup is definitely not a good match. Furthermore, that discussion may be helpful to others and not only related to Vmware. In the long run, I may adapt clonedisk to this behavior (like not put the target disk offline before restoring which may prevent windows from "touching" the disk). Could it be something connected to the way the image is mounted? Maybe the "full" size is wrognly accessed. What is on the "bad" image in the 34 sectors following sector #2096606? Likely there is the actual "backup" of the "bad" GPT , and if this is the case it means that *somehow the whole stuff was triggered by a size access issue. I.e. the whole thing *somehow* has been mounted as having 2096640 sectors. Then the Windows would not find the backup of the GPT, assume that it has been corrupted and - since there are holes in the partition table order - decides to optimize it while re-writing the backup GPT. "Wrong", but starting to make (a little) sense. Thus I may re start from scratch next week. The image was never mounted (imdisk or else). The source disk was generated by Vmware ESXI installer (the same installer that leaves empty entries in the partition table). The "good" source image was obtained from converting a vmdk to a raw image (using libvmdk) and was left untouched since then. The "bad" source image was obtained from a converting a vmdk to a raw image (using libvmdk) after it was "corrupted" by a winpe (booting within the VM). "bad" and "good" come from the same source (virtual) disk. Note that it seems to be a known issue on vmware forum that windows will mess up the vmware / gpt partition table : is it triggered by a missing/bad backup table or because windows does not like empty entries in a GPT table, I cannot tell. I would be tempted to go for the second as I am pretty sure I have dealt (without issues) in the past with images without a backup table (but it was a MBR image, not a GPT). It seems that windows behaves differently with GPT (more aggressive) compared to MBR. Yep that is the good (and the bad) of GPT vs. MBR (and viceversa). MBR has NO "backup", you lose first sector and it is game over. But it is of course usually simple to rebuild the partition table contents in this case. Which of course is one of the stupidest things that one could insert in a specification, if you have the "main" table you don't need the backup, and if you don't have it (or it is corrupted) there are little chances that by sheer magic the particular field at offset 0x020 is good, and even if it is, if any other part of the table is corrupted the checksum won't verify, an so you cannot trust it. So what may have happened is that for *whatever* reasons the Windows accessed the image without loading the last 512 sectors (why? ), found out that there was no backup table, panicked and rebuilt the backup table and while at it reordered/compacted the used slots. What has to be found out is why the image was loaded/accessed with a smaller size.